Just like in my last Summer Reads post (here), the book covers and synopsis's are from Amazon and Goodreads, and the collage was made on PicMonkey. Every year Isabel spends a perfect summer at her family friends' house. There's the swimming pool at night, the private stretch of sandy beach . . . and the two boys. Unavailable, aloof Conrad - who she's been in love with forever - and friendly, relaxed Jeremiah, the only one who's ever really paid her any attention. But this year something is different. They seem to have noticed her for the first time. It's going to be an amazing summer - and one she'll never forget . . . I'm not going to put the official synopsis here as it gives away a few things from the first book, but basically this second installment follows Belly through another summer where she has grown up a bit more. This means that Jerimiah and Conrad have also grown up and changed, leaving her even more torn than before. She has to choose between the brothers whilst trying to stop the summer tradition from changing. Like the second book, I'm not going to put a synopsis here as it spoils the rest of the trilogy and gives away major details. Basically Belly has no choice but to make her final decision between Jerimiah and Conrad, and now that they are all a good bit older they have all changed. She is completely torn as these are the two boys she has ever loved but she has to make her decision. A lot of tears were shed during this book...My opinions were flipped and changed completely which made me cry, and my prediction was completely wrong which also made me cry...So emotional. :'( The characters, writing style and plot were all still amazing and I enjoyed this book a ridiculous amount. I'd HIGHLY recommend the Summer trilogy by Jenny Han!! The year is 1985. Brian Jackson, a working-class kid on full scholarship, has started his first term at university. He has a dark secret—a long-held, burning ambition to appear on the wildly popular British TV quiz show University Challenge—and now, finally, it seems the dream is about to become reality. He's made the school team, and they've completed the qualifying rounds and are limbering up for their first televised match. (And, what's more, he's fallen head over heels for one of his teammates, the beautiful, brainy, and intimidatingly posh Alice Harbinson.) Life seems perfect and triumph inevitable—but as his world opens up, Brian learns that a little knowledge can be a dangerous thing. Tessa has just a few months to live. Fighting back against hospital visits, endless tests and drugs with excruciating side-effects, Tessa compiles a list. It's her Before I Die list. Released from the constraints of 'normal' life, Tessa tastes new experiences to make her feel alive while her failing body struggles to keep up. Her feelings, her relationships with her father and brother, her estranged mother, her best friend, and the powerful, bittersweet first love she finds with the boy next door - all are painfully yet beautifully crystallized in the precious weeks before Tessa's time finally runs out. Who is the real Margo? Quentin Jacobsen has spent a lifetime loving the magnificently adventurous Margo Roth Spiegelman from afar. So when she cracks open a window and climbs into his life - dressed like a ninja and summoning him for an ingenious campaign of revenge - he follows. After their all-nighter ends and a new day breaks, Q arrives at school to discover that Margo, always an enigma, has now become a mystery. She has disappeared. Q soon learns that there are clues in her disappearance ...and they are for him. Trailing Margo's disconnected path across the USA, the closer Q gets, the less sure he is of who he is looking for. I read the review for the ''Summer i turned pretty'' and it is fabulous! 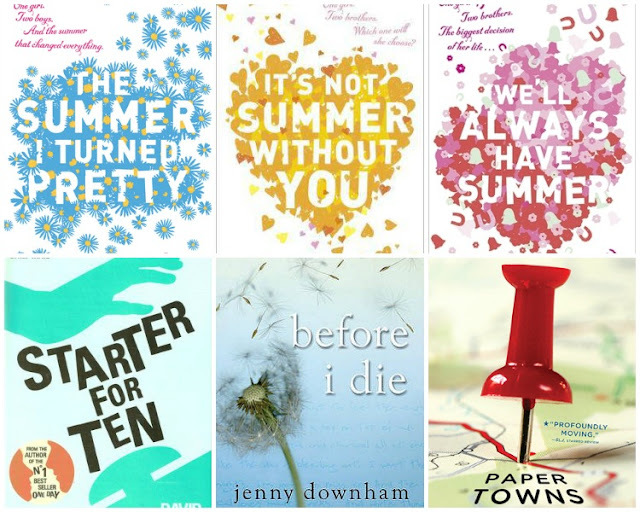 I've read Jenny Han's books, as well as Paper Towns. I'm actually reading Paper Towns for the third time right now. It's one of my favorite books. Who knows? You may see a posting with a whole bunch of Paper Towns quotes sometime in July. I've been catching a lot of quotes while reading!